The Department of Philosophy (University of Malta) and the Students’ Philosophical Society, recently launched and celebrated Jean Buttigieg’s new publication, titled The Human Genome as Common Heritage of Mankind. This highly stimulating and meticulous research seems to centre itself upon the perennial question, often felt as an urgent demand from the author: What is life? Throughout Buttigieg’s thesis, it becomes immediately clear that he is uncomfortable with the scientific reductionist approach to the question of life as he strongly argues that such a debate has been unfairly hijacked by the scientific community and, in turn, by private businesses. Buttigieg is surely no Luddite and, in fact, what he proposes is a meaningful dialogue between philosophy and science. Galileo’s scientific project had established mathematics as the epistemological ground for our knowledge of the world. Thus, mathematical properties of things are thought of as what constitute the thing itself, hence primary qualities, while all other qualities – such as meaning and value – are understood as subjective, and secondary. The external world, including the body, is no longer understood as a human incarnation of a spiritual life; it becomes a thing belonging to the natural sciences. This scientific project and philosophical claim eventually seeped down to a wider popular view, becoming a cultural convention whereby it is taken to be the standard portrayal of the real. What Buttigieg is proposing can be understood as an invitation to unshackle one’s mind from this modern dualistic framework and deliberately suspend our deep-rooted habit of taking the world for granted. As a result, this modern scientific attitude ends up losing its concern with deeper philosophical questions by narrowing its goals. Knowledge of nature becomes understood as objective only in a positivist sense. However, as the author clearly advises, the humanistic sciences must urgently ask different questions that account for the meaning of life. Buttigieg expresses his concern of salvaging a more fully-fleshed, multi-dimensional notion of life from being completely lost in the world, and hence taken for granted and left unexplored as a result of this radicalisation of positive science and materialism. Buttigieg draws his inspiration from an internationally acclaimed diplomat, scholar and university professor – Arvid Pardo, famously known as the Father of the Law of the Sea Conference, who worked hard for the introduction of international regulations to ensure peace at sea, to prevent further pollution and to protect ocean resources. It was Pardo who employed the phrase “common heritage of mankind”. He uses this term in relation to the sea bed, implying that no state could appropriate these natural resources, since they belonged to all of humanity. And, by all he means those living and those yet to be born. Pardo had realised that the seabed was the only remaining, untapped resource in the world which, as yet, remained unclaimed. There was no well-defined legal framework that could prevent this unfair exploitation of natural resources because the high seas were still subject to the laissez faire attitude which allowed the developed countries to exploit the deep seabed and ocean floor once they had the technology to do so. His proposal to the United Nations was that all humanity would take it upon itself to create the conditions necessary for the use of the seabed and ocean floor for the benefit of all mankind. Pardo’s notion of common heritage echoes the same idea of the universal common good in the innovative encyclical that Pope John XXIII had addressed to the whole world in 1963, called Pacem in Terris (Peace on Earth). In the midst of the Cold War the Pope had argued that it was still possible to discover policies at a global level that would be acceptable to both sides, west and east, despite them seeming to be engaged in hopeless ideological warfare. He had envisaged that the common good of humanity could only be achieved if there was international cooperation. Both Pardo and Pope John XXIII accentuate the importance of safeguarding the interest of the community rather that the individual, private interests. And this is what Buttigieg takes up from both intellectuals. 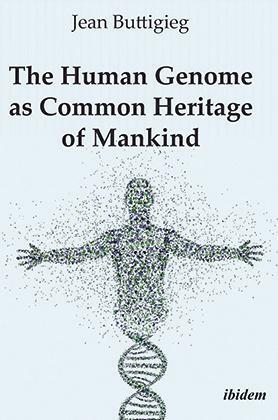 In fact, the author is here defending a kind of research which adopts a genuine interdisciplinary, cooperative framework between science, philosophy and religion, and operates with a multidimensional notion of life which, ultimately, has the common good of humanity as its goal – in this case, preserving the human genome as a common heritage of mankind. Buttigieg skilfully, and cleverly, employs other important theories to expose the question of life in all of its complexity. But, without delving in all these theories here – you can do that yourselves while enjoying this colourful tapestry the author has carefully knitted for us. I believe that his work is also serving the noble cause of restoring a genuine way of doing philosophy by asking perennial questions whilst pointing towards significant theories, developed throughout the centuries, in order to keep serving as guidelines for the fast-paced, dodgy developments which are happening around us.